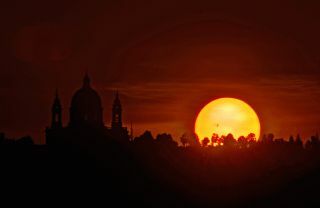 Gigantic sunspot AR 1476 is evident as the sun rises alongside the Basilica of Superga in Turin, Italy. A magnificent sun rises alongside the Basilica of Superga in Turin, Italy, with the massive sunspot AR 1476 in clear view. Astrophotographer, Stefano de Rosa took this stunning photo on May 10. Measuring 60,000 miles (100,000 kilometers) across, the massive sunspot was first detected on May 5, 2012. Mission scientists dubbed it a “monster sunspot” because of its large size. The giant sunspot AR 1476 triggered M-class solar flares that released blasts of radiation and magnetic solar plasma. M-class flares are the second-most powerful sun storms and often create dazzling displays of the Northern Lights. However, they are typically not strong enough to damage infrastructure or satellites near Earth.